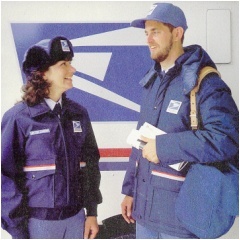 Type 1 Postal Uniforms: worn by city letter carriers, motor vehicle operators, tractor trailer operators and others. We carry a full line of postal uniforms, rainwear, accessories and shoes for Letter Carriers and others required to wear Type 1 uniforms. Our postal uniforms are Union Made and Made in the USA by highly respected, USPS approved manufacturers. And, our prices are the most competitive in the industry! If you have worked 90 days as a CCA and/or TE, you are eligible for a $390 postal uniform allowance. We are a leader in CCA uniforms and are now accepting orders.